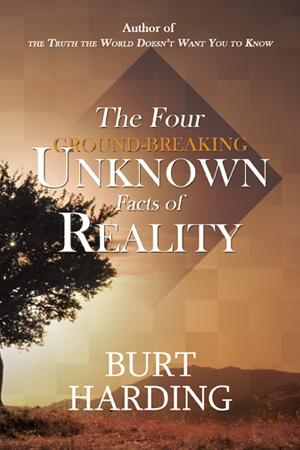 Understand these Four Unknown Facts of Reality and you will never think the same again. These Four Facts of Reality will answer every possible question about life. Anything the human mind can ask is clearly delineated in these four magnificent and clear-cut truths. They will explain the seeming paradox of truth, the self-contradictions, the reason we sabotage ourselves, the fears we labor under, the emotional pains we keep repeating, the unrelenting frustrations of coming and going, the inability to have faith in our own true nature and, most of all, why we cannot comprehend simple obvious truths about us. For those ready and ripe individuals, these four facts are a great blessing. They are simplicity itself and make psychology, philosophy, metaphysics and all spiritual beliefs so clear that peace and faith are a natural result. Burt Harding offers a radical invitation to recognize the truth of our being as already whole and fulfilled. He reminds us of the love we really are beyond the emotions and personal stories we carry. In this way, we come to recognize how beautiful we really are in our essence. Burt lives and teaches in Canada.